At the Atlantic magazine “Future of the City” forum, a speech by Julius Genachowski, Chairman, Federal Communications Commission (FCC) and two panels covered how information and energy technologies can be incorporated into cities to facilitate economic growth and enable more sustainable consumption. Genachowski said the new U.S. broadband plan is “revolutionary” and an example of “great strategic planning.” The plan calls for incentivizing investment in broadband infrastructure, the deployment of municipal broadband networks, and expansion of broadband-based applications in the areas of health, education, energy, government, as well as more than one hundred other actions. A new broadband plan is critical to the future of cities. Cities spur innovation by enabling clusters of creative people to connect. Enhanced urban broadband infrastructure is then key to ensuring high-levels of connectivity. While 65 percent of the country now uses broadband, less than 50 percent of minorities do. “This is primarily an urban issue.” Genachowski added that the costs of digital exclusion are rising given you must have computer access to apply for jobs, network, and tap services. Blair Levin, The Aspen Institute, Robert Atkinson, The Information Technology and Innovation Foundation, Sascha Meinrath, The New America Foundation, and Jim Cicconi, AT&T, explored current and potential smart city applications. One panelist said we need to create a “broadband ecosystem” to enable the growth of more advanced applications. Through ubiquitous broadband access, cities can then become “smart” and restructure how they function. For instance, Japan is now adding instruments to their roads so traffic congestion can be monitored in real time. Bridges now have “smart sensors” embedded in them to monitor traffic and structural health. San Francisco has launched an innovative smart parking meter system which enables residents to use their cell phones to find and reserve available parking spaces. This will also help cut down car-driven CO2 emissions because some 30 percent of urban driving is associated with finding a parking spot. Additional applications would enable cell phone users to monitor urban air quality in real time. Smart city technologies will enable faster dual-way sharing of information between “central government data sources” and residents. Residents can send data in and receive data from the government. “Emerging handheld devices, machine-to-machine systems and interconnected devices” will help facilitate these interactions. Some of the challenges to creating the smart city were also explored. A recent survey of residents of Baltimore and Washington, D.C. showed that 100 percent could access to broadband, but many couldn’t afford the service, which means urban broadband penetration is not likely to be ubiquitous time soon. One panelist said: “This is really about computer literacy. People get broadband only if they have a computer.” Another potential obstacle relates to capacity: new smart city and smart grid applications may be bandwidth hogs so it’s unclear whether the capacity providers are developing will be enough. Lastly, there are policy and regulatory obstacles: the U.S. doesn’t have a government subsidy program like Sweden, which has invested some $32 billion to bring broadband to all citizens. In the U.S., private sector firms are expected to fund infrastructure roll-out and meet universal access requirements (but receive a range of incentives). Mark Brownstein, Environmental Defense Fund (EDF), Paul Camuti, Siemens Corporation, Jim Connaughton, Constellation Energy, and F. Michael Valocchi, IBM discussed emerging smart grid energy technologies and their potential impact on cities. Camuti added that “people are concerned about getting too much information. They don’t want to get an energy bill that looks like their cell phone bill. They also don’t understand the concept of the smart grid — smart grid benefits need to be really clear.” Valocchi agreed, adding that “we’ve been using terms like dynamic pricing that no one understands. We need to use language consumers understand.” Indeed, one major threat to future consumer acceptance is the AARP’s recent decision to oppose the smart grid because of fears of increased prices and bill complexity once the system gets rolled-out. At its core, the smart grid would also reduce CO2 emissions from electricity production, which currently accounts for 40 percent of total emissions. “The current system really is the problem.” A new smart grid would also avoid creating new coal power plants — it would enable us to “turn over capital stock.” Over time, renewable energy sources could then replace coal plants. Most importantly, a smart grid is needed if you are going to ramp up renewable energy production because wind and solar energy production is “variable.” Only a smart grid can handle that variability and still provide enough electricity to power those electric vehicles ready replace old gas-guzzlers. 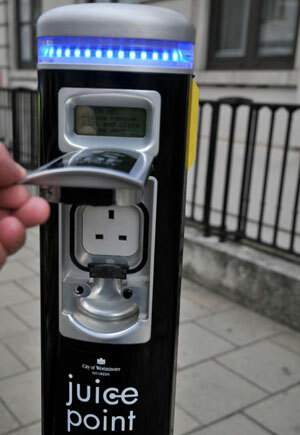 Valocchi said this is already happening, just not in the U.S.
Energy utilities providing electricity to cities will need to create local smart grid action plans that can enable the roll-out of smart meters and electric car charging stations in homes, businesses, and public infrastructure, including streets. The word ecosystem implies a biological community. I think we need to be careful not to undermine it’s meaning and importance with phrases like “broadband ecosystem” etc.